Black Onyx | What’s Reverse Searing? There’s a new kid in town, well a new method really, for cooking the perfect steak. We’re not talking about a flash in the pan, one-hit wonder that kicks around for a while and then scurries away when we all realise we’ve been blinded by yet another short lived food trend. We’re talking about a rule breaker that’s turned the method of cooking steak on its head. And it not only competes with traditional cooking results, it surpasses them. So what is this magical technique? It’s called reverse searing. Think of it this way. With the traditional high heat searing method, you sear both sides of the steak in a pan and then transfer to the oven to finish. This technique still has merit and it’s brilliant for thin steaks. With reverse searing, you do exactly what it says… reverse it. You cook the steak low and slow in the oven, rest it, and then finish it by searing it in the pan. 1. You’ll achieve a perfect medium/medium-rare throughout, top to bottom. 2. Cooking the steak slowly in the oven breaks down the fat and connective tissue, making it melt-in-the-mouth and super juicy. 3. The oven dries out the surface of the meat, so the proteins are prepped for ultimate browning and you’ll get a more intense and even sear than you’ve ever gotten before. This is called the maillard reaction. 4. The meat is already rested mid-process so you can sear it, slice it and serve it immediately. 5. There’s no more guess work. Cook the perfect steak every time. Traditional – Sear, Sear, Oven: When you cook a steak with the traditional sear, sear, oven technique, you usually get a bullseye effect with the steak. A hard crust on the outside, a thin ring of well done, then a ring of medium-well, and then medium, all the way down until you reach your desired doneness in the middle. Reverse Sear: The whole steak is medium rare. You’ll get a thin, intense layer of charred crust on both sides, and the entire steak, edge to edge is a beautiful medium-rare. 1. Thicker cuts achieve the best results. Go for cuts such as rib eye, T-bone, sirloin or fillet that are at least 2.5cm thick. 2. Pre-heat the oven to 135oC. 3. Season your steaks really well with salt and pepper. Always add a little more salt than you think you need. 4. Place your steak on a metal rack over a tray covered in foil to catch any drips. 5. Cook until the internal temperature reaches 50oC. The time this takes will depend on the thickness of your steak. You’ll definitely need a good meat thermometer to measure this. Don’t try to wing it! 6. Remove from the oven and rest for 10-15 minutes under foil. 7. Pre-heat a heavy based pan until it’s super hot. Like, sizzling hot! 8. Sear steaks for 1-2 minutes on each side. 9. Slice and serve immediately. So the next time you’re grilling a steak, give reverse searing a go. It might just change your life. 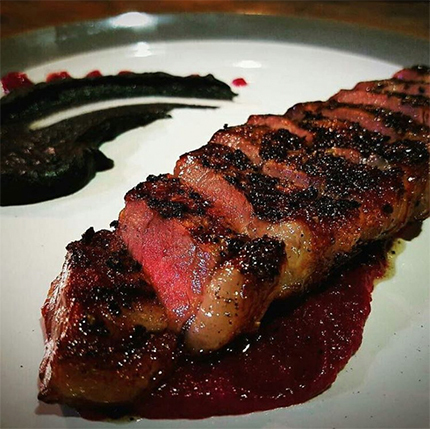 This is an example of a reversed seared 28-day dry-aged Black Onyx sirlion from @pauluslahidin on Instagram. Looks incredible, doesn’t it?